The Fernox F5 Express Central Heating Cleaner at PlumbNation part of the Fernox central heating range from Fernox. The Fernox F5 Express Central Heating Cleaner is an aerosol product designed to make dosing a system quick and simple with no mess or inconvenience to the user. 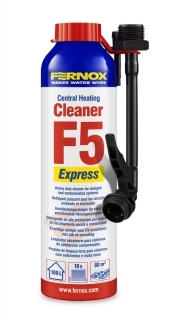 As with all Fernox Cleaners, the Fernox Cleaner F5 Express is an effective neutral cleaner. The Fernox Cleaner F5 Express has been designed for pre-commission cleaning of new installations in accordance with BS7593:1992, removing flux residues and other installation debris, to help extend the life of a system. The Fernox Cleaner F5 Express can be used in conjunction with Fernox Powerflow MKII machine and all known makes of powerflushing machines to remove all debris, sludge and scale from existing systems. In this way, it will restore heating efficiency and eliminate or reduce boiler noise in heavily contaminated systems. Cleaner F5 Express is a neutral, non-hazardous product that is well inhibited and compatible with all metals and materials commonly used in heating systems. If the system is heavily scaled the use of Fernox DS40 System Cleaner is recommended.